How to have A Successful Yard Sale – PART FOUR – How and where to Advertise | Cook, Party, Enjoy! ADVERTISE, ADVERTISE, ADVERTISE, to Reach Your Potential Customers! People enjoy yard sales and there are a lot of folks who go out every week end in pursuit of treasures. So by advertising in advance you let them know about your sale so they have time to make the decision to attend YOUR SALE. Although Signs are the best source of customers, don’t assume that a couple of signs put out the night before or early morning will bring a crowd. Also don’t forget the power of the printed word. Ads are still very effective at getting customers to your SALE. Use the for free available sites on the internet too for getting the word out. Keep your budget handy so you don’t spend too much on your advertising campaign. Use the tips I have provided and look for FREE advertising options FIRST! 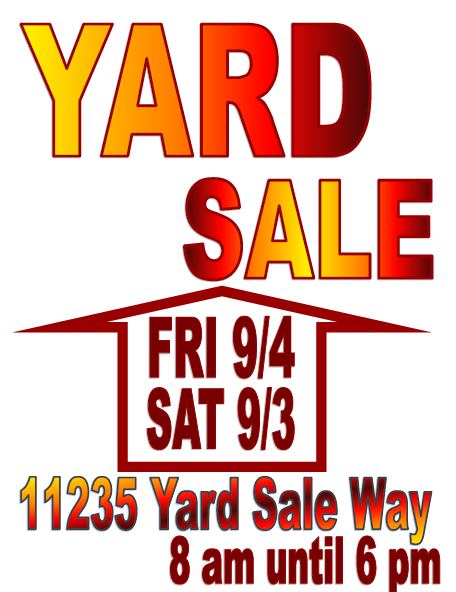 When you need to save money or having a last minute sale, If at all possible watch for other yard sales being advertised and piggyback on their ads and signs. 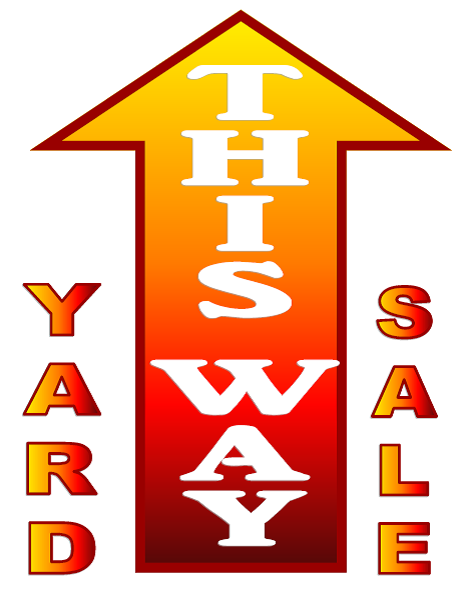 If there is a sale up the street from yours or on the same main street as you are off be sure to place your signs from their sale to yours. It is advisable to let the neighbor know you are going to put your signs after his and make sure you don’t confuse customers on where to turn. I always talk to the person having the sale and offer to refer customers to them if they will do the same for me. This works really well if you decide to have a sale at the last minute because there are so many sales going on around you and you decide to pull some stuff out to join in on the fun and of course make some cash. People still read the newspaper so consider it for an ad but only if you have some high price items. Newspaper ads are not cheap and they could quickly eat into your profit. Ask if they have a cheaper online ad space. Community papers are a great place for your ad. The only drawback is to check on their placement policies because of the different time frames of when they go to print. Sometimes they need your ad a month to 45 days in advance. Craigslist FREE has a yard sale section so I would absolutely put an ad there a couple of weeks in advance of your sale. You can post pictures so it would be a good idea to list many of the items you will have for sale and include pictures. Ebay offers a site that began as Kijiji.com and is now ebay classifieds you can list your sale under the category garage sales in you area. There is site weekendtreasure where you can post an ad for $7.99 (price may change)and people search for sales by their zip code. It’s like a google maps/classifieds combined. It lists literally thousands of sales plotted on an interactive and searchable map making it easy for people to easily find the sales they want to attend. 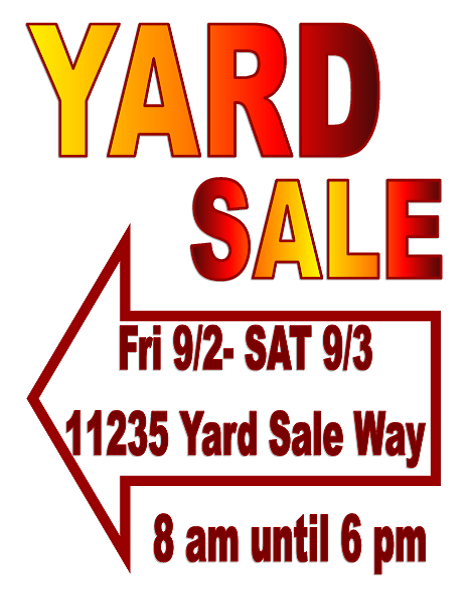 Flyers are a great way to get the word out about your SALE! 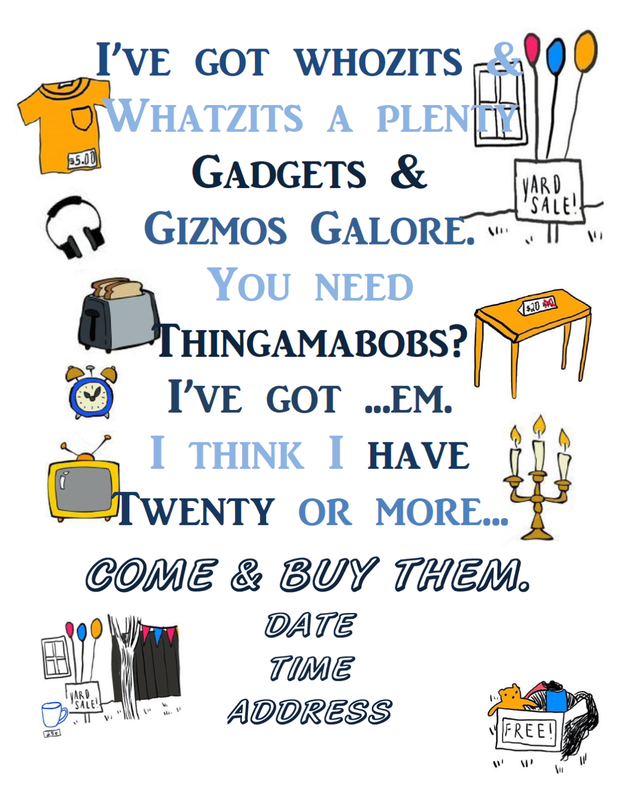 Print up some simple eye catching flyers to put up on bulletin boards around town. Signs are easy to read if lettering is dark and background is light. Do not use fancy letters, plain simple lettering is best. If your local allows you can staple signs or you can use wooden or metal stakes. Covering signs with plastic wrap or plastic sleeves will protect them from the weather or you can spray them with clear polyurethane, Krylon makes a good one and it dries fast. First things first you must check with your local government about any rules that pertain to posting signs for yard sales. Most locals restrict posting on street signs, traffic signs, and trees. Start at your house on the google map and then look for major through roads big and small. Plot out where you think your signs should go. Don’t have the internet then drive around and make a drawing of the roads and where they intersect. Include intersections of close major roads and post a large sign and then lead them in using smaller signs with arrows. To figure out how many signs you will need plot the signs on the map and get your number. This pre plan will save you time and money. Post a Large sign facing traffic from both directions at major intersections using a sign with arrow pointing in direction they should turn. Post a smaller sign about every couple hundred yards so they don’t think they are going the wrong direction. Post Large sign for Turns. Then again Post a smaller sign about every couple hundred yards to next turn. Use a Large sign at your sale with balloons, banner or anything that will let the customers know this is the sale. I usually put my bigger items near the road to draw customers in. After you post your signs drive the route and see if you can follow and see all the signs. Just a reminder after your sale be sure to take your signs down. If you want the pdf of the signs I made up like the ones above but with blank space for you to write in date, time, and place just send me a comment with your email and request it and I will email it to you for FREE. Just fill in the form below. until later… betti b. 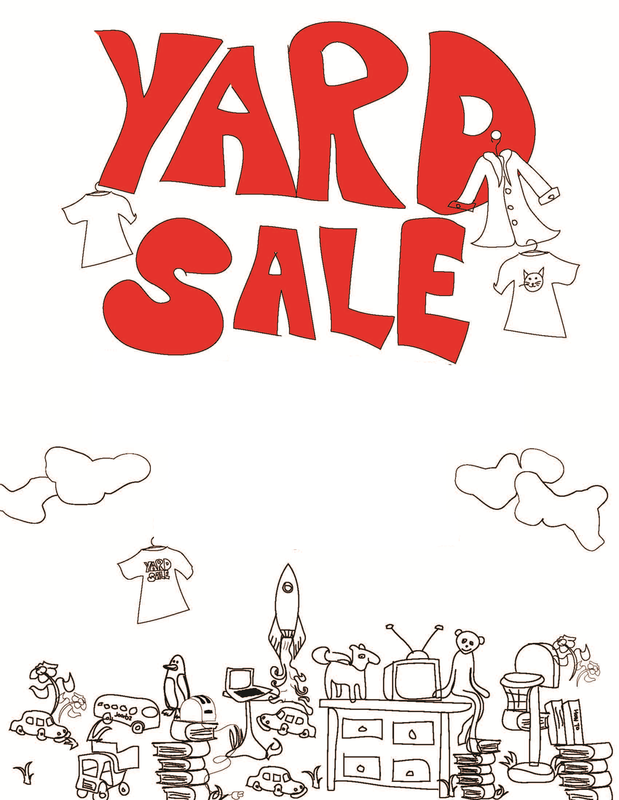 There is Only ONE part left of the yard sale series. 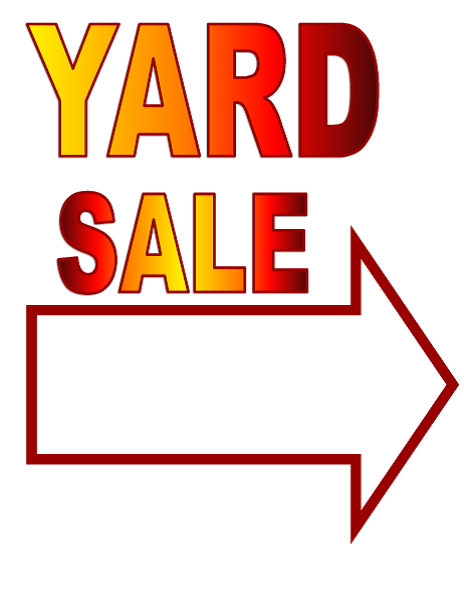 PART FIVE –The day of the Yard SALE. What to expect. coming soon!